Are you looking around for the perfect folded card that has just the right message and artwork on the front panel? It’s a tough task and you can find yourself looking through the card aisle at your local card store or pharmacy for what seems like hours. Why not have your card, your way, and customize your own folding cards for any occasion! Folding photo cards can’t be beat when you want a classic greeting with a high quality look. That’s why we offer folding graduation photo cards that you can custom design inside out with pictures and text! Include your grad’s favorite high school moments on the front along with a personalized message on the inside indicating the time, date, and place of your upcoming ceremony and party. With just a few simple steps, you can create the ultimate grad card to celebrate this once in a lifetime occasion! Maybe you’ve already picked out a Mother’s Day gift for Mom. Make sure you don’t forget the greeting to go along with it! Instead of browsing local stores and card shops, you can create your own custom Mothers Day cards that come from the heart! 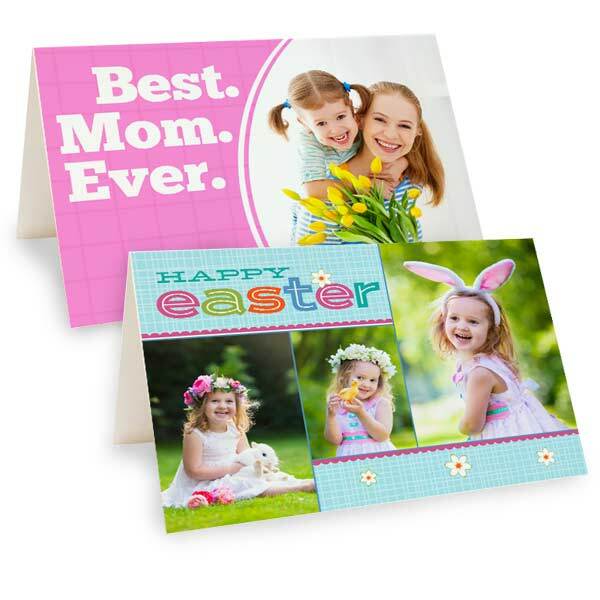 Design yours with Mom’s favorite photos and include a loving message on the inside to let her know just how much you care. Our folding photo cards are a tried-and-true classic that are ideal for any occasion, including Fathers Day! Pick out a favorite photo that means a lot to Dad, and have it custom printed on the front of your folded greeting. You can print your photo full size, have it placed on an elegant background, or create a collage of pictures from your phone. MailPix is the best site online when you want to make quick and easy custom Fathers Day cards that have a professional look! Need a gift for dad too? We offer Fathers Day photo gifts galore which you can personalize just like our folding greeting cards! At MailPix, we make designing cards a fun, stress-free affair. Simply gather your photos, upload them to Mailpix and start creating! Incorporate your own personality into your card design by adding your own photos and unique message. Begin designing your cards by simply uploading your photos from your computer to your Mailpix photo folder. Secondly, choose your folding card orientation, either vertical or horizontal. Afterwards, choose from our range of elegant templates to fit the occasion. After opening your card in the project builder, just drag and drop your photos from your photo folder and onto your layout. Then, add your own text. Finally, review your completed layout and place your order. Since our custom folded cards arrive with their own envelopes, they are ready to send out once you receive them. Add your own personalized handwritten message to the inside of your card and send them out as simple “hello” or during the holidays for an elegant, festive greeting. As you know, customized cards are perfect for sending out on a variety of occasions including party invitations and announcements! Planning your wedding and looking for custom wedding invitations online? At MailPix, you can create the perfect wedding invitation cards using your favorite engagement photos, text and the choice of dozens of folding card designs. Photo wedding invitations are sure to add a personalized touch to your big day as a whole and are available in a range of style to compliment your wedding day theme. Plan ahead and create wedding thank you cards along with your invitations to prepare for the big day! Our folded cards with photos are a great option for custom save the date invitations as well. Create photo save the date wedding cards or make your own card design for an upcoming party. Folded save the date cards are perfect for any upcoming party, event or occasion. Need cheap graduation announcements? Maybe your son or daughter’s big day is just around the corner and you have your heart set on custom graduation invitations personalized with their best senior photo. Our folding greeting cards are ideal for the occasion. Choose from several stylish, trendy graduation announcements of various styles to fit your graduate’s personality. Everyone should have a set of attractive thank you cards to send out to friends and family to show your gratitude for a special deed or a thoughtful gift. Why not make your thank you stationery unique by incorporating a prized photo into your design. Thank you cards are perfect for sharing a favorite landscape photo you took on your last hiking excursion or a fun snapshot of yourself and your family. Include a message of thanks on the inside of your cards and then a personalized handwritten note to make your loved one feel appreciated. For invitations, holiday greetings, announcements or save the dates, MailPix has your covered. Personalized folding cards are a great way to keep up with loved ones or invite them to your upcoming celebration. Make your folded cards stand out using your best pictures and use our text feature to add your own customized message for any occasion. Building a folding greeting card of your own is both fun and easy. Just upload your treasured memories, pick a card template and design your own card in no time!